Wow! What a jam-packed day we had in Rio. We started the morning off with a hearty breakfast while listening to two student presentations. Maggie Dunbar '17 got us ready for some samba later in the afternoon by sharing her research on the history, cultural influences, and today's practice of the dance. 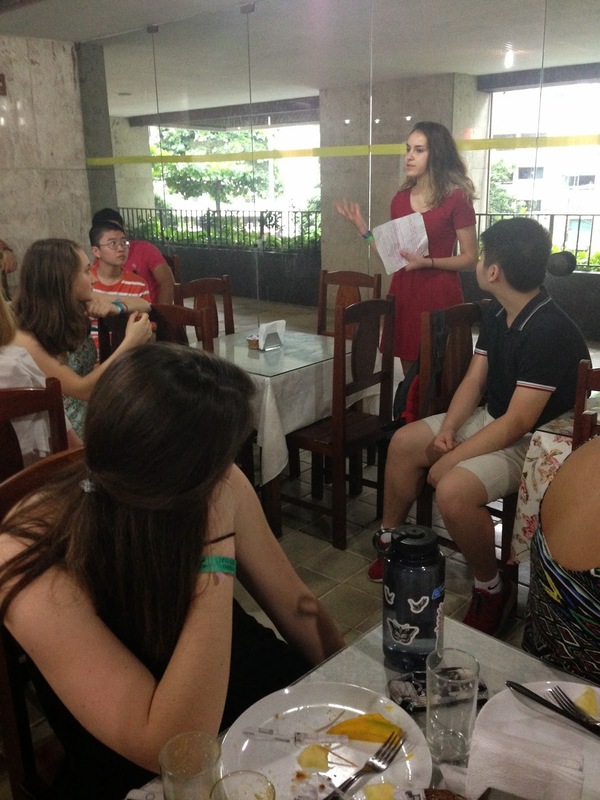 Lila Jacobs '17 followed her up with an introduction to the flora and fauna of Brazil. Lila informed us that with four million species, Brazil is the most biodiverse country in the world. Her task than in giving us an overview of the entire range of species was a difficult one. However, Lila left us feeling completely ready for our first stop of the day in the Botanical Gardens! We were immediately awed when we arrived at the gardens, as the 900 varieties of palm trees that Lila had mentioned were now right in front of us! For Lila, it was particularly neat as the first view inside the gardens was one that she had seen in her research. As we made our way through the grounds, Javier explained more about the history of the gardens. 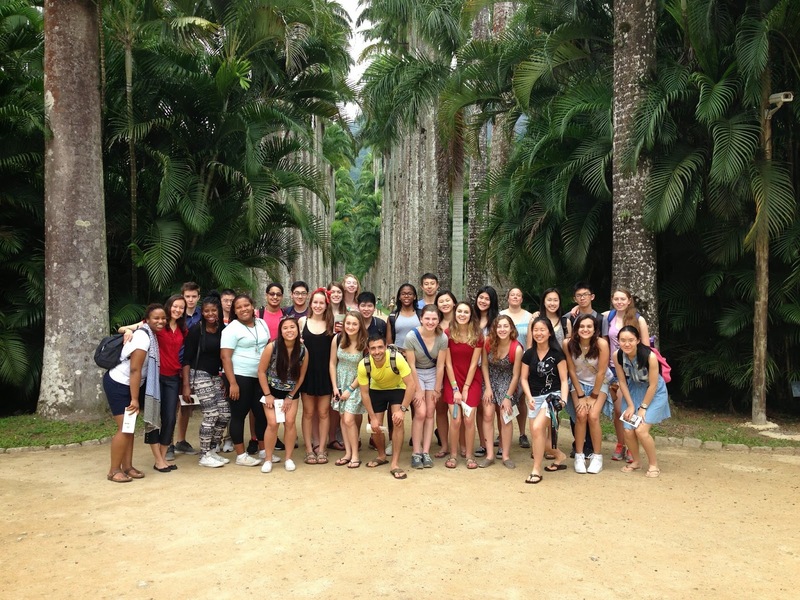 We learned that while there were many types of flora endemic to the country inside the gardens, that they were originally established to test valuable foreign crops that were previously imported into the country. Our next stop on the day was to the Ladeira dos Tabajaras community. Earlier in the morning, Javier had introduced us to Roberta de Souza and her assistant Melissa. Roberta lives in the community, and having trained as an official guide, she works frequently with Javier. Roberta brought us into her house, and we had a great conversation about the reality and myths of the favelas of Brazil. In our reflection time later on, Lila made connections and drew contrasts with what the group had discussed in English class. "In English, we learned about 'slumming it,' something that the upper class in Victorian England did. They went around poor areas and just watched. Honestly, that's how I was picturing our favela visit, and that made me really uncomfortable. Luckily I was pleasantly surprised. Having Roberta's family invite us into their home and have people who lived there answer our questions alleviated my fear of being gross tourists gawking at people who live differently than we do. Hearing from their perspective made me realize how much I just thought of the favelas as hell, and how much more complicated it is than that. I assumed everyone there was unhappy and hoping to get out, but that was not the case for everyone. Some people move there voluntarily and some don't want to leave. Even with enormous flaws, there was a sense of community, and for some, that is enough. Marcus Lin '17 would write that, "Before going to the favelas, my only impression of them were statements made by people about how direly poor favelas were and how much in need of help they are in. But as I went into the favelas today, they seemed like they were doing well and not desperately in need of our help. [This goes to show] that stereotypes shape how we think about a person or group of person and how we should not always trust those stereotypes." After a quick lunch, it was back to the 'classroom.' 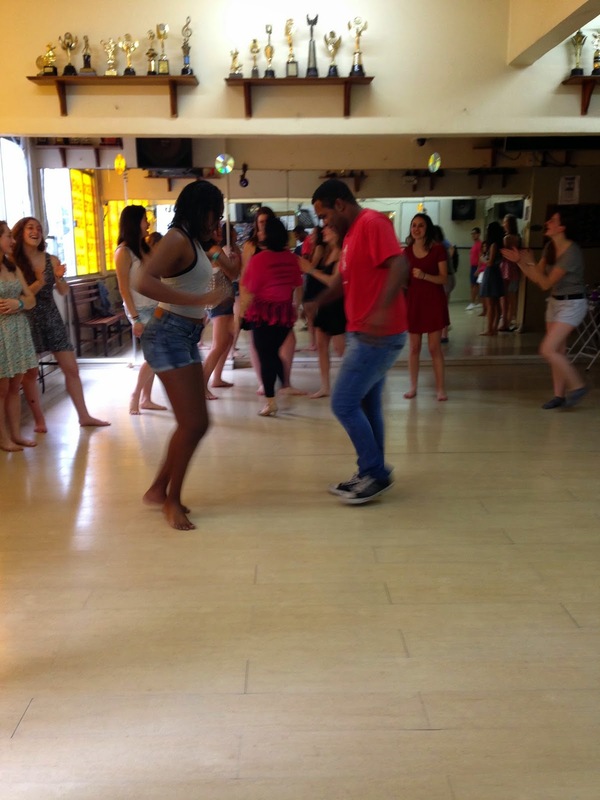 We all tried our feet at our Samba lessons, with some of us flashing a few great moves! The evening finished with an amazing meeting with a percussion group comprised of young people from a nearby community. Everyone in our group got to try an instrument, and as our playing got progressively better, we started to attract a crowd! As quickly as we developed, we were not up to the very high level of our teachers who took over at the end to give the entire park a performance. Their guest star however, was Malcolm Cochran '17! Malcolm really impressed many members of the percussion group! For Sunday, we have a bit of down time as we get to watch a soccer match at the famous Maracana stadium! We'll hear about the stadium, soccer in Brazil, and about a Chilean artist who worked in Rio from student presentations to start the day.